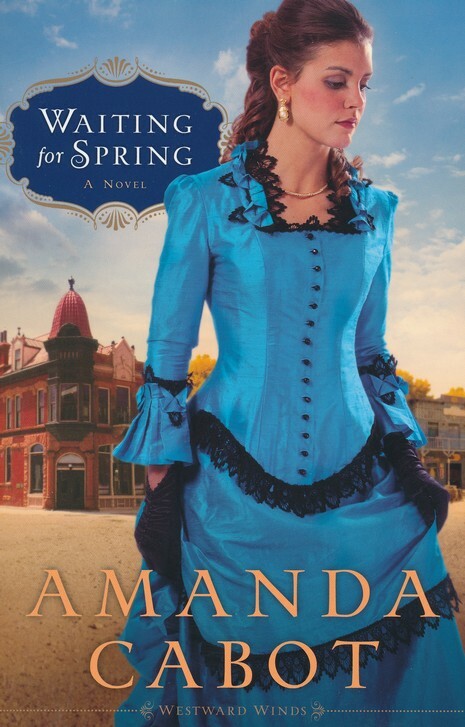 Amanda Cabot’s second book in the Westward Winds series, “Waiting for Spring”, can be read as a wonderfully engaging stand-alone novel. I have not read the first book of this series and felt neither lost, nor unsatisfied. Amanda has also brilliantly developed a bad guy you slowly love to hate. He starts off seeming only slightly untrustworthy … and eventually his true nature leaves you squirming with displeasure — earnestly turning pages to learn how his bad intentions will affect the hero and heroine. A wonderful story — based in the early years of Cheyenne, Wyoming. It definitely makes it onto my favorites list for the year. May I say that the dress steals the show on this cover? But … since the story is about a dress maker it totally works! The vibrant blue color draws attention, and the style of the dress establishes it is a historical set in the late 19th century. This cover will appeal more to women, but since that is the same target as the story, it is a great match. One small factoid that I thought was fun about this cover design, is the fact that the title grouping is actually partially hidden behind the cover model’s shoulder. The designer was obviously aware the model and the dress ‘steal the show’ — they are purposely letting it, by giving the title grouping a secondary status in this design (though they did add a touch of gloss to balance it a little). 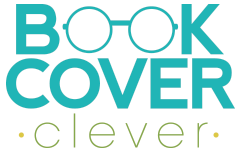 * This book was provided by the publisher with no guarantee of a positive review. Available January 2013 at your favorite bookseller from Revell, a division of Baker Publishing Group. Amanda Cabot explores themes of love, courage and sacrifice in the second book of the Westward Winds series. 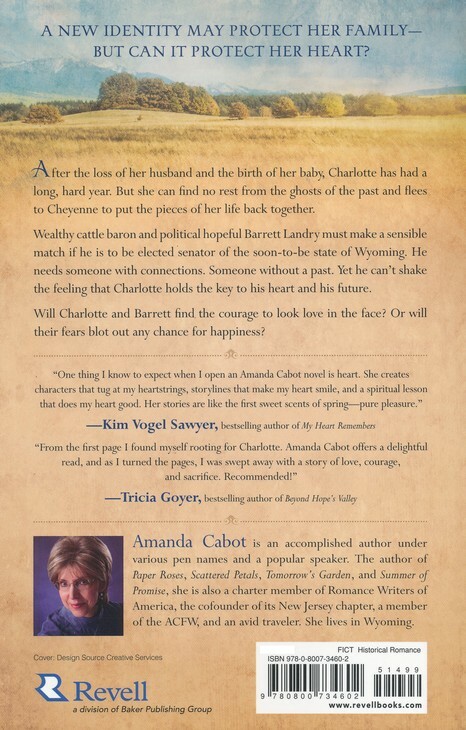 With an authentic backdrop of 1880s Wyoming, Cabot creates characters whose struggle to forge a life in the old West ultimately win your heart. After the loss of her husband and the birth of her baby, Charlotte has had a long, hard year. But when a notorious robber believes she knows the location of a long-lost treasure, she flees to Cheyenne and opens a dressmaker’s shop to lie low and make a living. When wealthy cattle baron and political hopeful Barrett Landry enters the shop to visit her best customer Miriam, Charlotte feels drawn to him. If Barrett is to be a senator of the soon-to-be state of Wyoming, he must make a sensible match, and Miriam has all the right connections. Yet he can’t shake the feeling that Charlotte holds the key to his heart and his future. Soon the past comes to call, and Barrett’s plans crumble around him. Will Charlotte and Barrett find the courage to look love in the face? Or will their fears blot out any chance for happiness? Amanda Cabot is an accomplished author under various pen names and a popular speaker. The author of Paper Roses, Scattered Petals, Tomorrow’s Garden, and Summer of Promise, she is also a charter member of Romance Writers of America, the cofounder of its New Jersey chapter, a member of the ACFW, and an avid traveler. She lives in Wyoming.